This article has 3 pages. You're on page 1. # 1. SWAT duty weapons sport optics for specific missions. Top to bottom: S&B Short Dot; Aimpoint M3; TA11 ACOG. With optics ubiquitous on fighting rifles, the old rule that long barrels - with their longer sight radius - are needed for accuracy and longer-range capability is turned on its head. It's possible to get one-moa mechanical accuracy from 18, 16, 14.5, 12.5, and even 10.5-inch barrels, perhaps at a higher cost. Thus, with even short-barreled CQB uppers able to provide pinpoint accuracy to the limit of the 5.56 cartridge's capability- the role differentiation is determined by what optic is mounted on the rail. Put another way- carbine capability is determined by its sights. The next problem is that there are five million optics sights on the market. Many are junk and need to be avoided. Others are good for hunting or target use, but not appropriate for a fighting rifle. Most are not suited well to the M4/M16 platform due to size, eye relief, or mounting issues. Finally, some organized thinking is required to figure out what capability and features you want in an optic to help, not hurt, yourself in getting your real job done. I break down optics in basically three types for fighting carbines: Type I, Type II, and Type III. Type I is basically CQB. Type II is basically DMR. Type III is SPR. Type I: 1x or non-magnified red-dot optics, optimized for close-range engagements and effective to the carbine's point-blank range (250-300 yards for a M4/M16 with a 50-yard zero). Type I optics are heads-up, not sensitive to eye position, most are parallax-free. 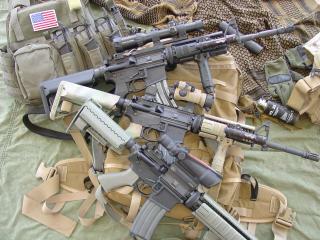 The most common Type I fighting optics are the Aimpoint M2-M4 and the EOTech. No magnification and heads-up binocular sighting provides the fastest sight-picture acquisition and the easiest to maintain while on the move. They are also the easiest to use from weird shoot positions. The downfall of the Type I optic is no magnification which hampers target ID (threat / no-threat). Iron sights still have a place due to bomb-proof mechanical simplicity, and fit in as a Type I sight.